One of the fields from which the European Union can benefit is definitively research and technological development. For example, within the European aeronautical sector, the current level of innovation would not exist without the close cooperation between the best companies in this sector and the support of the European institutions. European aeronautical innovation, which in this case comes with the name Clean Sky: the EU's flagship program, fostering advanced technologies. 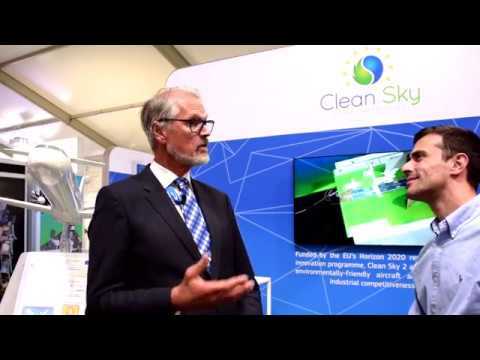 Ron Van Manen is the leader of the Clean Sky 2 Research Programs: the second edition of the platform that includes all the major aviation projects and research and development initiatives. Speaking from the Clean Sky exhibit area at the last Farnborough air show, Van Manen has no doubts about where the priorities lie within the projects. "There are no compromises, flight safety is paramount, and all aeronautical research must start from this premise". "The engine architecture, its configuration, will necessarily also influence the aircraft architecture in order to pursue objectives such as performance improvement or lighter components." Starting from this primary theme, Van Manen proceeds to list the other major European research projects aimed at improving the future of air traffic in every respect. "When we talk about European research, the focus is on new engine and aircraft configurations, new materials and eco-sustainability. For example, we are studying and developing new ways to increase the volume of air that aircraft engines use to generate thrust, or to improve their aerodynamic efficiency, also aiming to reduce noise. Because, in the future, take-off and landing will increasingly take place in urbanized areas." Van Manen says that this is a very exciting time for research, given the number and diversity of projects up and running, and that the importance of the engine, considering all the constituent parts of an aircraft, will grow more and more. "The engine architecture, its configuration, will necessarily also influence the aircraft architecture in order to pursue objectives such as performance improvement or lighter components. In addition, combustion efficiency, which means lower fuel consumption, will take us increasingly in the direction of hybrid, or even fully electric, solutions." Avio Aero, which has worked alongside the Clean Sky Joint Undertaking since its inception, is also part of Clean Sky 2 and is present on various projects for different classes of aircraft, thus collaborating directly with aircraft manufacturers (the so-called "airframers"). What Van Manen says is true: the aircraft and its configuration are increasingly influenced by the engine, that is, by its essential components. "Developing conventional turboprop and turbofan engines to achieve determinate levels of efficiency requires radical solutions in terms of engine architecture. That's why we've been investing heavily in research and development of new architectures for years: to consolidate our position among the aeronautics leaders of the future," says Enrico Casale, Head of Programs for the Introduction of New Technologies at Avio Aero. "Research activities in this field have a very high economic weight, often unsustainable for some companies: for example, an aircraft engine’s life cycle is 5 or 6 times longer than that of a car, as well as requirements and certifications facilities are way more expensive". The Clean Sky 2 projects that see Avio Aero at the forefront range from Contra-Rotating Open Rotor (CROR), validated in France some months ago, to the recent development of an engine with an unprecedented configuration for use on regional airliners, part of the IRON project. In the latter, cooperation with Leonardo, the aircraft manufacturer, is in fact focused on aspects of engine to aircraft integration. "We've been investing heavily in research and development of new architectures for years: to consolidate our position among the aeronautics leaders of the future"
Another important Clean Sky2 project which sees Avio Aero involved and which - in addition to close collaboration with the aircraft manufacturer, the world leader Airbus Helicopters - shows a high degree of innovation aimed at the efficiency of performance and materials, is called RACER. A new super fast helicopter, whose appearance is clearly influenced by the engine configuration: in fact, the RACER is the evolution of a helicopter. In addition to the main rotor, its wings are equipped with propellers. Avio Aero is responsible for the transmissions - which are among its leading products - on board the RACER: the main rotor transmission and the power gearboxes on the wings that transmit the movement to the propellers. But RACER also benefits from the disruptive industrial technology with which Avio Aero has been making a name for itself in the sector for about a decade, additive manufacturing. "All program activities have a strong additive core," Casale explains. "Our pioneering profile in this field has been consolidated through work on the new GE Catalyst engine: the freedom of design and the reduction in parts guaranteed by the use of additive allows us to build lighter products that are less demanding from a consumption point of view and therefore more eco-friendly". Casale, in addition to his experience in the Catalyst program, refers directly to the work carried out together with the so-called Avio Aero Design for Additive team, which studied and applied additive technology to produce a component for the RACER. "It's not always easy to match brand-new industrial processes such as metal 3D printing with state-of-the-art engine development programs: in aviation in particular, the materials used to manufacture the various parts have a crucial impact on production processes. For example, in terms of thermal properties and resistance" explains Casale. Nevertheless, he managed to introduce the first 3D-printed component on the RACER: an Air Cooled Oil Cooler (ACOC). "Developing and producing the three heat exchangers on the Catalyst engine has made this innovation possible on this futuristic aircraft too," said Casale. From the words said by both Van Manen and Casale, it’s crystal clear how essential the union of intentions among the European actors is: a consolidated research network, with key industrial partners, small and medium enterprises, the main universities and last but not least, the institutions. A network that Avio Aero has been cooperating with for some time, but that on the European territory reaches such a competitive position only thanks to the presence of Clean Sky and the best-in-class of Europe’s Aviation industry.